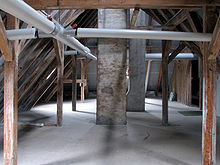 (countable) An attic is the space just below the roof of a house. It may be used to store items or is sometimes big enough to live in. I have a bunch of old clothes and toys stored in the attic that I would like to get rid of. This page was last edited on 23 April 2017, at 11:51.